Pop culture references, with little distinction made between the mainstream and the obscure. Being pretentious, but also being self-mocking about being pretentious. Using caption boxes to seed atmosphere. Trying hard. Yes, this is riffing on arty comics of the day, chiefly Sandman. The words are also, strangely, true. Igor Goldkind’s career with Tharg began in the PR department. He may have been the first person designated with this specific job, as far as I know – and it’s for this role I suspect he is best remembered by the sort of Squaxx who care about what goes on behind the scenes. Goes by I-Groid or IG-Roid. Beyond 2000AD, Goldkind is given credit in all sorts of places for pushing the term ‘Graphic Novel’ as a marketing term deliberately designed to get booksellers to stock comics, and non-comics readers to actually buy and read comics. One could spend a lot of time talking about the term, and all the good and bad going on within it semantically. But the main thing to note is that it worked. Booksellers and ‘serious’ publishers did and do use it, and buying readers still respond to it – at least, the sort of readers who don’t read weekly or monthly comics. Not as much as perhaps people once thought they would in the late 80s, but on balance the creation of ‘graphic novels’ as a marketing term has done a lot of good to promote comics as adult-worthy literature in the English speaking world. 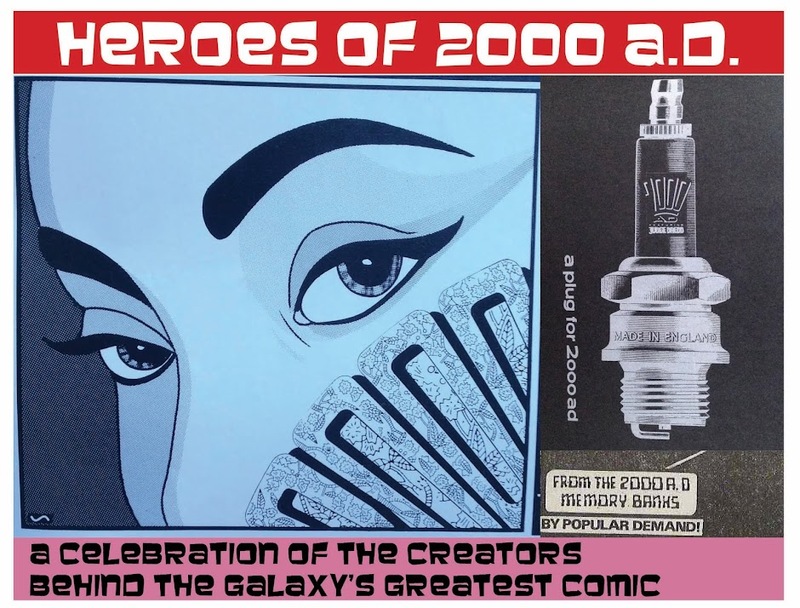 None of which has anything to do with 2000AD! Except that it may well have been Goldkind who filled up many a page of the Prog with ads for collected editions of stories that originally ran in Crisis, obviously aimed at older readers. In turn, he was surely a big part of the push that aged 2000AD from being aimed at 8-12 year olds and instead for 12-25 year olds (and let’s ignore the fact that we’re all** pushing that delightful 30-60 demographic nowadays…). All of which is funny, given that when Goldkind’s own voice started hitting the Prog from 700, it was anything but grown up. A classic taste of IG-Roid-ian rambling. Art at the top I think by Dave D'Antiquis just for some flavour. Until that point, Tharg’s Nerve Centre had been an outlet for tiny nuggets of Thargian wisdom, then as now devoted to a mix of self-aggrandising and trailing upcoming series. But most of the page was devoted to reader art and letters. Come the Goldkind/Burton/McKenzie era, and it all changed to a brace of pages known as ‘Output’ – Tharg to us, and ‘Input’ – us to Tharg. 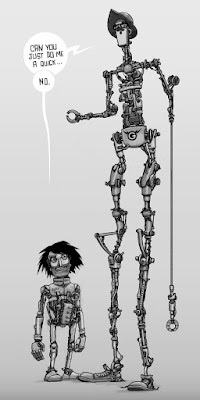 To fill up all that extra space on the Output page, enter IG-Roid (Goldkind’s droid persona), and lots of prattling on about all the many pies Tharg had his fingers in, and just how good all those pies were, and why you should rush out to buy them. The early, experimental phase of this change saw IG-Roid throwing his sense of humour and playfulness onto the page, with decidedly mixed results. But so what? These paragraphs were likely read by few then and remembered by even fewer now. But I appreciate the effort, and the fact that he was going for something other than being a snivelling droid minion, as was the standard trope up until then. Based on this actual printed work, IG-Roid comes across as a character from a slightly more grown up children’s comic, but never looking down on the content of the day, which veered wildly from the basically for children stuff (Harlem Heroes, Junker) to the super trendy stuff (Time Flies, Hewligan’s Haircut) to the actual grown up stuff (Shamballa, Button Man). I believe Goldkind gets as much ‘blame’ as anyone for courting the trendy NME-type crowd of the late 80s/early 90s, which some quarters mark as the beginning of the bad times for 2000AD. I can well believe he did court that crowd, but I don’t suppose it hurt the comic nearly as much as the change in distribution channels that was beyond Tharg’s control. Mind you, I’ve no idea if it made any difference to bringing in a new crowd to the comic’s pages, either. PR – if it was a science, everyone could do it. So much for the uninformed idle speculation. What about Goldkind the comics scribe? Well, he had two proper cracks at ongoing series, again with mixed results. 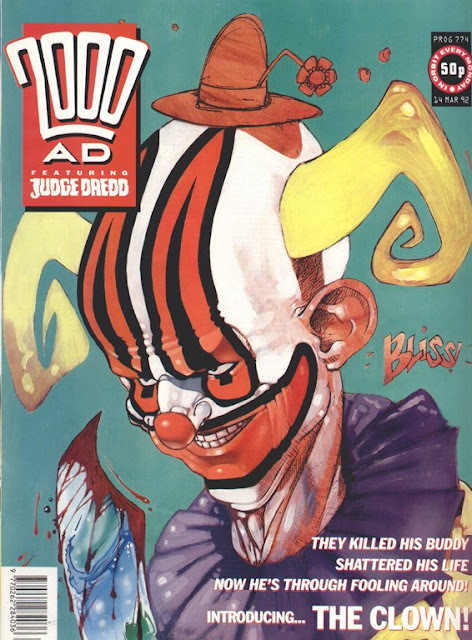 2000AD got The Clown, and The Megazine got the first serious attempt to get a Judge Hershey strip to work in its own right. I love the Clown, although I’ve a strong suspicion most people don’t. In the first place, it’s the luscious artwork that draws me in, from the mysterious Robert Bliss. 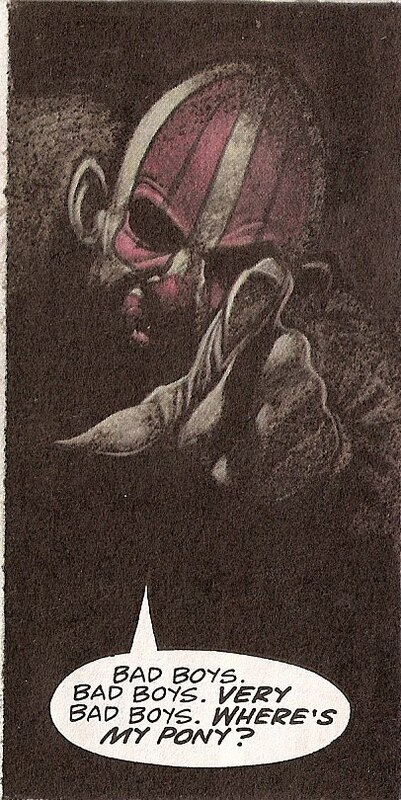 A name that sits so perfectly with this image of the titular murderous clown. I just love how the 'Bliss' tag functions as a bit of comics emanata as well as the artist's signature. NB the Clown in the story is not nearly as sadistic as the image suggests. I understand that killer clowns are something of a cliché – although I don’t know how far back that actually stretches. But I have no problem with this idea being basically another monster, such as vampire, werewolves and zombies. But for this tale, Goldkind was deliberately embracing clichés and trying to push beyond them. Nominal ‘hero’ Special Agent Joe Brummer was - to my eyes - clearly a riff on Dale Cooper from Twin Peaks, then big on TV, for example – only Goldkind pushed the character’s nature as a collection of foibles, and almost no actual personality, to the limits. Brummer has very particular tastes. Very particular tastes. And a good line in deadpan. Apparently the whole thing is intended as a satire of Sandman. Either I haven’t read enough of that series, or else it’s just too oblique a satire for me. I'm guessing this is a Gaiman pastiche. Art by Bliss. And it really adds a lot. Personally, I enjoyed it plenty on the surface reading of a weirdo Clown who wants revenge on the bad dudes that killed his pony. Let’s talk about the titular Clown. He’s both a hero and a villain, in the classic 2000AD vein. Yes, he is murderous, but the target of his murder absolutely deserve what they get. Otherwise, the dude just wants to be a proper good clown and make children smile. And that’s the full extent of who the Clown is. It’s almost Millsian in its 2000AD purity. Well, I guess they do look a bit like what a gang of ne'er-do-well school children might grow into. Art by, yup, Mr Bliss. One can’t help but think neither Bliss nor Goldkind had actually read the actual Bash St Kids, they just had some vague idea. Mind you, great pic. Series 2, on the other hand, was pretty much pure balls. Shorn of his defining murder story, the Clown himself doesn’t have enough to do, or rather, doesn’t have enough to do to bring smiles to my face. Bringing in aliens, who can be defeated only by the power of laughter, is a silly enough idea to suit the story, but not funny enough. Agent Brummer doesn’t get to do much more than repeat his jokes from the first series, and repetition alone isn’t funny the second time (although it usually is the third, fourth and fifth time; see for example Sinister Dexter). Still some cracking artwork, and in comics that's more than half the battle, of course. Why so straight, dialogue? Why not layer on the arthouse narration again? Art by Greg Staples, I think, who took over early on in Book II. Art definitely by Bliss, this time. Judge Hershey wasn’t funny at all. And in a way, this was the strip’s defining feature. I can’t remember if Goldkind was the first person to try writing a solo Hershey tale, but he certainly has a good crack at trying to make it work beyond being a Judge Dredd story with a different Judge as the main character. And the way he does that is through the tone of the story – it’s a bit creepy (in large part thanks to excellent work from Kevin Cullen), and it is in no way funny, unlike 99.9% of all Judge Dredd tales. Judges killing prostitutes - not funny. Arguably it veered slightly too far into being pretentious. A trick he had tried with the Clown, where it was played for laughs, while here it’s portrayed instead as ‘well, why shouldn’t stories about Mega City Judges be a bit grown up and literary’. And he has a point, although I would say the two stories he wrote we not that good. The Harlequin was the villain, but he had a pretty valid point. Getting Hershey to question her perception of the system is a great way into a solo series for the character. What the two series did attempt was a peek into Hershey’s life off-duty, which includes such activities as going to the theatre. Again, why not? She’s got an intellectual side, and you can’t just have her sitting at home polishing her gun and obsessing over law manuals, a la Joe Dredd. I’m kind of sad that we didn’t get more of Goldkind’s Hershey, as it could’ve been fun to develop this side of Mega City one life, especially off-duty Judges who aren’t being criminals or Wally Squad nutters. Well, she's never entirely off duty. For full-on pretentious pretension, I can only imagine Goldkind’s work for Crisis is worth a read, but I haven’t had the opportunity. But in the end, that was it: two series of Clown, two of Hershey, the latter at least with the promise of more that could have been pretty good. So it goes. And a review on Down the Tubes of his most recent work, Is SHE Available – an ambitious poetry-based project (or at least, so it appears?) that shows Goldkind still has the kind of clout that draws some rather high end collaborators, including 2000AD-ers Glenn Fabry and Rian Hughes. First Prog: not sure there’s a specific ‘first Prog’ for this behind-the-scenes hero, but his text piece in Prog 1526 is as good a place to start as any. Total appearances: 59 – if you count up his articles and text pieces. One the one hand, this doesn’t fit into the count anyway as I haven’t included interview appearance for any of the creators involved. On the other hand, the man has such a constant presence on Twitter, the forums and all over the internet shouting loudly about 2000AD that it feels as if he deserves a far higher count. PR, eh? What could be less punk and spirit of 1977 than that? Well Molch-R makes it work, somehow. Sure, he’s shilling product, but he manages to do it in a way that feels in keeping with said product. Not in the sense of promoting class war or turning ideas on their heads or exploring sci-fi concepts, but in the sense of embracing the joy of solid entertainment. Maybe it’s the moustache and monocle that he doesn’t actually wear, but seems like he is wearing anyway. And above all it’s the way that he so clearly loves 2000AD. Much like me, he gives the impression of basically liking pretty much everything 2000AD has ever done, and really liking quite a lot of it – apart from the stuff he downright loves to pieces. As I understand it, he started out as a journalist and scored some early work from 2000AD/ the Megazine with a bunch of creator interviews. Based on his book series, it seems he has access to just about everyone, and no one is shy of talking to him. Being well-liked is an underrated gift. He then moved into Tharg / Rebellion’s full-time PR guru, and has even taken on an assistant, I believe. Since then, he’s pretty much become 2000AD’s most high-profile real-life character, in terms of daily/weekly presence. 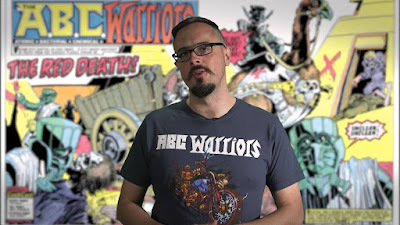 Sure, one is never too far away from a Pat Mills written screed or on-screen rant, but Molch-R seemingly never rests, always ready with a cheery message, or dragging a reluctant Cyber-Matt into the pod booth. Or, when he’s not doing the talking, seeding stealth publicity campaigns to get the blood flowing. Given that I’ve been reading 2000AD basically every week since 1991, and since about 2005 have been pretty regularly hitting up the 2000AD forums, it’s kind of wonderful that the comic has still managed to deliver delights and surprises that I haven’t spoiled for myself, whether it’s twist endings of stories, that we didn’t even know had a twist to come at the end, or the sudden reappearance of long-dormant characters, or the outrageous mindbomb of Trifecta. It’s not as if there wasn’t publicity, but it was just handled so well that it piqued excitement without diluting the fun. I guess the maxim is ever, ‘quality speaks for itself’. The weekly Thrill Mail, always bursting at the seams with both things to buy, things to remember, and things to read/watch. The 2000AD Thrillcast, never less than essential. - but I can’t help singling out the 3-part epic interview with John Wagner, which was delightfully candid, informative and made it feel as if the two were genuinely having a lovely chat that someone happened to have recorded. Would that all interview-based podcasts achieved this balance. -and, more recently, I loved the roundtable he set up as a paean to the work of Arthur Ranson. The 2000AD ABCs. I imagine there’s quite a bit more effort than it appears to make these short snippets. I’m super excited that he’s really going for EVERYTHING, not just the stuff that has been collected and reprinted. Occasional alphabet-order slips only add to the excitement, as you never know when something missed might get slipped in later. Video production credits - unknown to me, sorry! In a delightful coincidence, the latest video as I upload this post is about The Clown. *Partly I just wanted an excuse to cover this colourful character before too long, but mostly it seemed the best way to introduce Molch-R onto the honour roll, a true contemporary hero of 2000AD. **OK, not all. 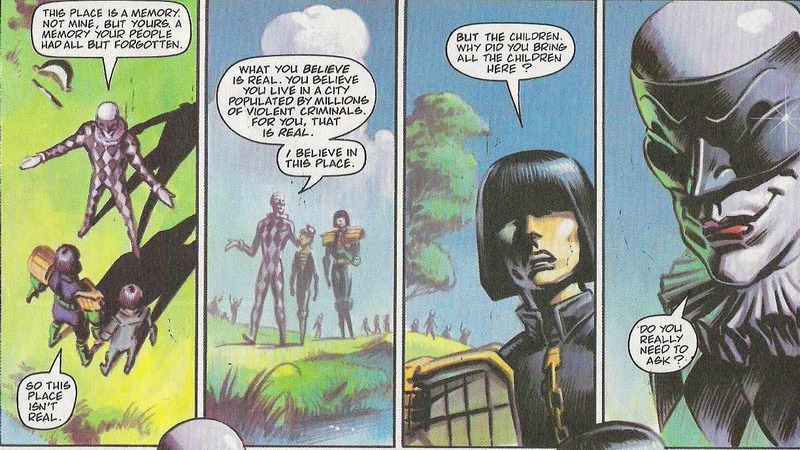 I’m pretty sure there’s a healthy chunk of child/tween/teen readers out there, who may or may not mostly be made up of children of lifelong 2000AD readers. You know, considering how long ago I wrote some of this stuff I think Alex is being quite generous in his criticism. He's absolutely correct that The Clown, my first ever strip commission after 3 or more Future Shocks were accepted over the period of a year, was a direct parody of Neil's Sandman series; but really one the first few of the first ever series. Neil's more literary approach to writing captions stood out at DC and there was some controversy at the time as to whether the tone had merit or was hopelessly pretentious. I went to the extreme of pretentious narrative for one because Neil was getting a lot of attention for doing it and 2, it contrasted nicely with the inane simplistic plot. A Clown working in an abandoned circus long gone bust, goes slightly crazy and has only one friend, Toby the pony who 3 thugs murder when The Clown's away looking for his gold "All Clown's got gold, everybody knows that". Then The Clown comes home find the decapitated Toby and flips out with grief and rage, sticking Toby's head on the end of a broom handle and goes on a murderous quest for retribution. He kills the thugs one by one in horrific manner always shouting his catch phrase"YOU KILLED MY PONY". Simple and easy just like a first time should. But the narrator seemed to be from a different story heaping flowery prose and attempting to make some profound, universal pronouncements from the antics of basically a gang of idiots. 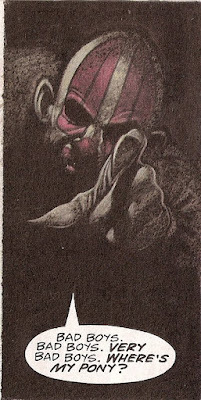 Clown II was dreadful and I regret submitting it, but Robert Bliss had had a kind of mental breakdown doing the first series largely due to his trying to compete with the fully painted Simon Bisley whom everyone was wowed by at the time. So the next artists were a scatter gun of new comers being tested out and they just got the scripts handed to them without any writer input from the writer. Judge Hershey was where I hit my stride with what I thought were two original takes that should have led to an ongoing series. But Hershey was Alan Grant's baby (creations) and he wanted her back. The best ever Strip I did for CRISIS was a one off called the Soldier and the Farmer about the Khmer Rouge beautifully painted by David Lloyd who drew V for Vendeta for Warrior before it was colourised. If you want to see the whole story and the beautiful water colour washes, you c an look for it online or purchase a copy of my book of Graphic Poetry IS SHE AVAILABLE? available in most comics shops, where a full reproduction of the stunning artwork appears on thick, matted gloss. 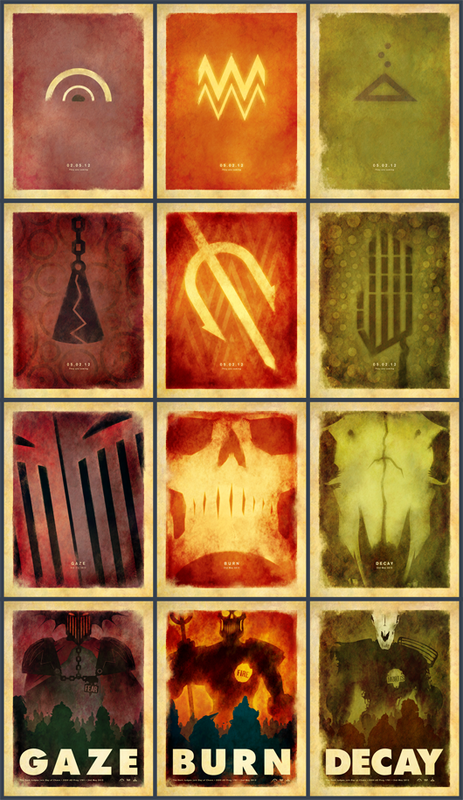 You don't happen to have any of that Clown artwork lying around? Ask Greg Staples or Robert Bliss. Someone just passed me a link to this and I wanted to say thank you very much for the lovely words - hope you've continued to enjoy everything over the last couple of years! You bet your sweet moustache I have!